For other uses, see Crimson (disambiguation). Carmine is the name given to the dye made from the dried bodies of the female cochineal, although the name crimson is sometimes applied to these dyes too. Cochineal appears to have been brought to Europe during the conquest of Mexico by the Spaniard Hernán Cortés, and the name 'carmine' is derived from the French carmin. It was first described by Pietro Andrea Mattioli in 1549. The pigment is also called cochineal after the insect from which it is made. Alizarin (PR83) is a pigment that was first synthesized in 1868 by the German chemists Carl Gräbe and Carl Liebermann and replaced the natural pigment madder lake. Alizarin crimson is a dye bonded onto alum which is then used as a pigment and mixed with ochre, sienna and umber. It is not totally colorfast. The word crimson has been recorded in English since 1400, and its earlier forms include cremesin, crymysyn and cramoysin (cf. cramoisy, a crimson cloth). These were adapted via Old Spanish from the Medieval Latin cremesinus (also kermesinus or carmesinus), the dye produced from Kermes scale insects, and can be traced back to Arabic qermez ("red"), also borrowed in Turkish kırmızı and many other languages, e.g. German Karmesin, Italian cremisi, French cramoisi, Portuguese carmesim, etc. (via Latin). The ultimate source may be Sanskrit कृमिज kṛmi-jā meaning "worm-made". A shortened form of carmesinus also gave the Latin carminus, from which comes carmine. Other cognates include the Persian qermez (or ghermez) "red", Old Church Slavonic čruminu, archaic Russian чермный (čermnyj), and Serbo-Croatian crven "red". Cf. also vermilion. Carmine dyes, which give crimson and related red and purple colors, are based on an aluminium and calcium salt of carminic acid. Carmine lake is an aluminium or aluminium-tin lake of cochineal extract, and crimson lake is prepared by striking down an infusion of cochineal with a 5 percent solution of alum and cream of tartar. Purple lake is prepared like carmine lake with the addition of lime to produce the deep purple tone. Carmine dyes tend to fade quickly. Carmine dyes were once widely prized in both the Americas and in Europe. They were used in paints by Michelangelo and for the crimson fabrics of the Hussars, the Turks, the British Redcoats, and the Royal Canadian Mounted Police. Nowadays carmine dyes are used for coloring foodstuffs, medicines and cosmetics. As a food additive in the European Union, carmine dyes are designated E120, and are also called cochineal and Natural Red 4. Carmine dyes are also used in some oil paints and watercolors used by artists. The crimson tide which sometimes occurs on beaches is caused by a type of algae known as Karenia brevis. 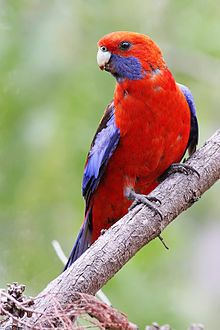 Crimson rosellas are a subspecies of parrot that are common in Australia. In George R.R. Martin's series A Song Of Ice and Fire, crimson is the family color of House Lannister. There is a Space Marine chapter in Warhammer 40,000 called the "Crimson Fists", who also paint the left glove of every warrior a deep red. In Polish, karmazyn (crimson) is a synonym for a magnate, i.e., a member of the rich, high nobility as only they may wear robing dyed from the scale insect. Rhubarb is sometimes poetically referred to as crimson stalks. The Danish hussar regiment's ceremonial uniform for enlisted, have a crimson pelisse. In the United States Army, crimson is the color of the Ordnance Corps. Multiple Greek letter organizations use crimson as one of their official colors: Delta Sigma Theta (ΔΣΘ), Kappa Alpha Psi (ΚΑΨ), and Kappa Alpha Order (ΚΑ). Crimson is the national color of Nepal and forms the background of the country's flag, and it also appears on the flag of Poland. This article incorporates text from a publication now in the public domain: Chisholm, Hugh, ed. (1911). "Crimson" . Encyclopædia Britannica (11th ed.). Cambridge University Press. ^ "American Heritage Dictionary", s.v. Kermes; also Kluge, "Etymologisches Wörterbuch der deutschen Sprache", s.v. Karmesin, et al. ^ Taherzadeh, Adib (1992). The Covenant of Bahá'u'lláh. Oxford, UK: George Ronald. p. 162. ISBN 0-85398-344-5. ^ a b "Graphic Standards 2018–19" (PDF). University of Alabama. May 18, 2018. p. 27. Retrieved December 31, 2018. Wikimedia Commons has media related to Crimson. This page was last edited on 8 April 2019, at 05:09 (UTC).